크낙새는 딱다구리과의 일종으로서 지구상에서 한반도 중부지역에만 생존하고 있으며, 현재는 멸종위기에 처해있다. 암수 구분 없이 몸길이는 46㎝ 정도이며, 수컷은 머리 꼭대기에 진홍색 깃털을 가지고 있다. 북한에서는 클락새라고 부르며, 광릉에서는 콜락새라고도 부른다. 광릉의 크낙새 서식지는 경기도 포천군 소홀면, 내촌면, 남양주시 진접읍, 별내면, 자둔면의 5개면에 걸쳐 있다. 광릉(光陵)은 조선 제7대 왕인 세조(재위 1455∼1468)와 왕비 윤씨가 묻힌 곳으로 능 주변의 숲은 조선시대 460여 년간 엄격히 보호되어 크낙새가 둥지를 틀고 살 수 있는 울창한 숲을 유지할 수 있었다. 비록 한국전쟁 이후 많이 변하였으나, 이 지역의 자생식물은 790종 이상이 알려져 있고, 나이 200년 이상의 크고 오래된 나무숲이 있어 크낙새가 이곳을 생활의 거점으로 서식하는 것으로 알려져 있다. 크낙새 자체가 우리나라에서만 사는 진귀한 새로서 학술적 가치가 클 뿐만 아니라, 한국과 일본이 대륙으로 연결되었다는 것을 증명해주는 살아있는 자료로서도 의의가 매우 크다. 그러므로 크낙새가 살고있는 이 지역을 천연기념물로 지정하여 보호하고 있다. 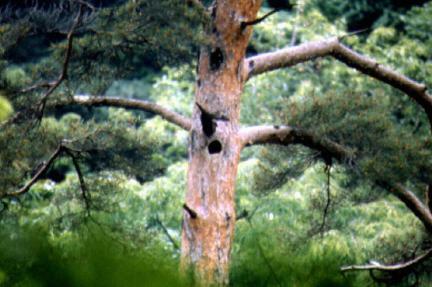 White-bellied Black Woodpeckers are a kind of woodpeckers and survive only in the middle area of Korea Peninsula. They are called 'Keullaksae' in the North Korea and 'Kollaksae' near Gwangneung Royal Tomb, Gyeonggi-do in the South Korea. 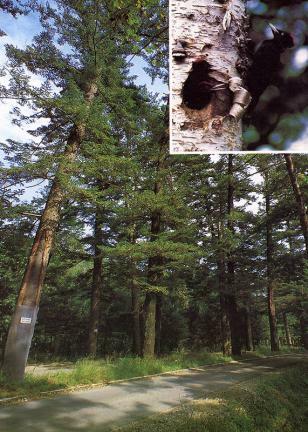 The Habitat of White-bellied Woodpeckers near Gwangneung Royal Tomb extends over five regions such as Sohol-myeon, and Naechon-myeon in Pocheon-gun, and Jinjeop-eup, Byeolnae-myeon, and Jadun-myeon in Namyangju, Gyeonggi-do. The White-bellied Woodpeckers are in danger of extinction. 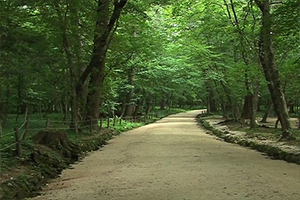 However, Gwangneung Royal Tomb could be maintained a dense forest where the White-bellied Black Woodpeckers can live and make a nest because it is a place where King Sejo and Queen Yun in Joseon are buried and the forest around Royal Tomb was strictly protected for 460 years of Joseon Dynasty. 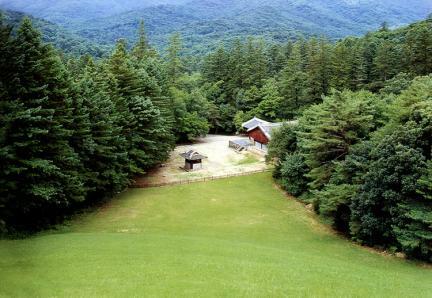 Although it has been changed a lot, native plants of this area are known more than 790 species and the forest consists of more than 200 years old big trees. The White-bellied Black Woodpeckers are mostly living here. 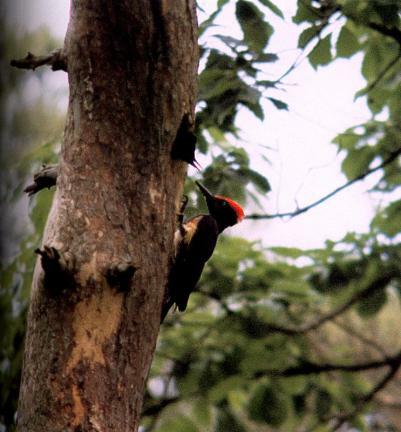 The White-belled Black Woodpecker is not only a precious bird living in Korea but also a material proving the fact that Korea and Japan were linked on land. Therefore, the habitat of White-bellied Woodpeckers is designated and protected as a Natural Monument.